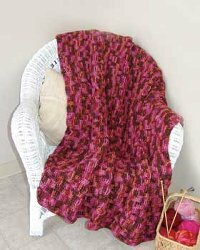 This is an easy free crochet afghan pattern from Bernat Yarns that you will love to have around all the time. It's an easy pattern which makes it perfect for beginners. Multi-colored yarns make this afghan colorful and fun...and you don't have to worry about changing colors. Perfect for adding color to your living room or bedroom, this rosy red afghan is great for snuggling and curling up with a cup of coffee and a good book. Gauge: 11 dc and 6 rows = 4 ins [10 cm]. Foundation row: (RS). 1 dc in 4th ch from hook (counts as 2 dc). 1 dc in each ch to end of ch. 129 dc. 1st row: Ch 3. Miss first st. 1 dc in each st to end of row. Turn. 2nd row: Ch 3. *1 dtrfp in each of next 7 dc. 1 dc in each of next 13 dc. Rep from * to last 8 dc. 1 dtrfp in each of next 7 dc. 1 dc in top of turning ch. Turn. 4th row: Ch 3. 1 dc in each of next 10 dc. *1 dtrfp in each of next 7 dc. 1 dc in each of next 13 dc. Rep from * to last 18 dc. 1 dtrfp in each of next 7 dc. 1 dc in each of next 10 dc. 1 dc in top of turning ch. Turn. Rep 1st to 4th rows until work from beg measures approx 48 ins [122 cm], ending with 4th row of pat. Fasten off. Side edging: With RS of Afghan facing, join yarn with sl st to lower right corner. With RS of Afghan facing, join yarn with sl st to upper left corner and rep for left side from ** to ** as given for right side. Add the size of the afghan that results. I need to make a lapghan that's 3' x 4', but without dimensions I have no way to adjust the amount of yarn (or accurately adjust the number of stitches in the width). Bernat seems to omit this important information from a lot of their free patterns.